The idea behind the World Cup Confidence Pool is to rank the teams from 1 to 32 based on who you think will win the most games throughout the World Cup Group Round and/or World Cup Tournament. Have the pool participants write the team name in the square beside the corresponding number. The #32 team being the team they think will win the most games, the #31 team being the team to win the second most games, and so on, all the way down to #1. Each time a team wins a game, the pool participant will get the corresponding points(rank = points). If a match ends in a draw zero points should be awarded. You can just use the Group Round and skip over the tournament column, but we prefer to continue accumulating points through the whole tournament. After the Champion is crowned, add up the points accumulated from each individual team and write that amount in the "Total Points" column. 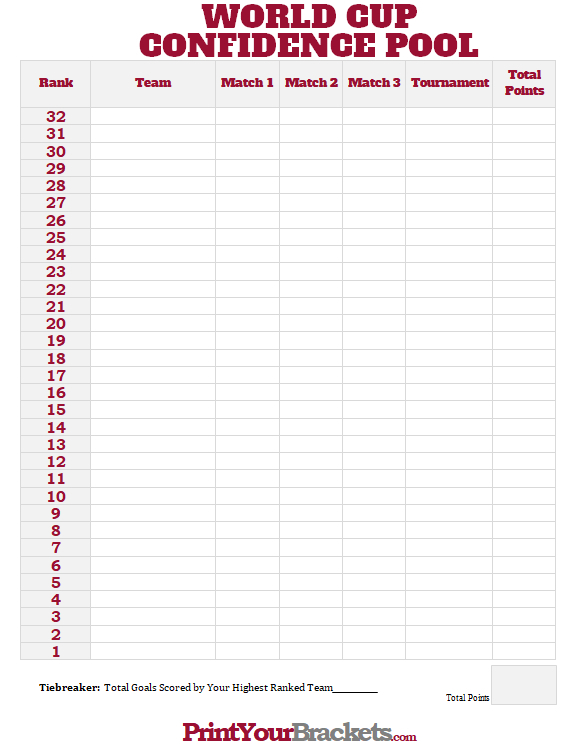 Then add up the points in the "Total Points" column and write the final total in the gray box that says "Total Points". The participant with the most points wins! If you're looking for another fun office pool to run try our World Cup Squares. Have each person write down the total number of goals they think their highest ranked team will score for the entire duration of the World Cup.